*Prices do not include on-road costs. 3.2-litre 4x4 dual-cab pick-up autos only. 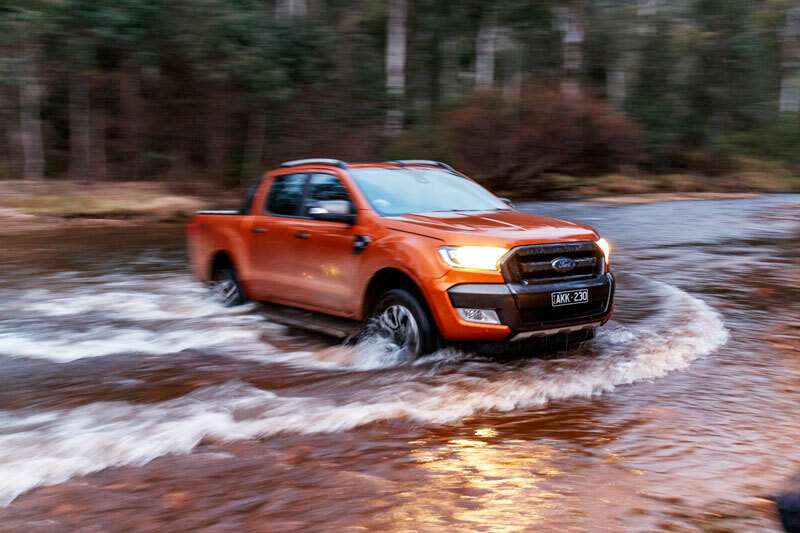 The Ranger is Ford’s runaway success story. It’s now Australia’s most popular 4x4 ending Hilux’s 12-year reign as the 4x4 sales champion. For Ford, the Ranger’s success is even better illustrated by how it sells against other Ford models. To the end of June 2017 Ford sold 21,638 Rangers, including 3075 4x2 models. Ford’s next-best seller was the Mustang with 5048 sales followed by the Focus with 3243 sales. And it’s all downhill after that. Like most Rangers the Wildtrak is powered by a 3.2-litre five-cylinder diesel, although there is a 2.2-litre four-cylinder diesel available in base-grade models. This five-cylinder engine does much to define the character of the Ranger and is certainly the key behind most of the things it does well. This is a big, low-revving engine, the biggest here in fact despite having less cylinders than the Amarok, and the one least willing to rev. Not that it needs to rev to get the job done as it’s so strong from idle and in the mid-range. It also has a unique feel and sound, completely different from the two fours (which are also different from each other) and the Amarok’s V6. With an uneven number of cylinders you may think it wouldn’t be a smooth-running engine, but that’s far from the case. Aside from an initial lumpiness at idle it actually feels as smooth, if not smoother than the two fours, which can be a bit buzzy in comparison at higher engine speeds. 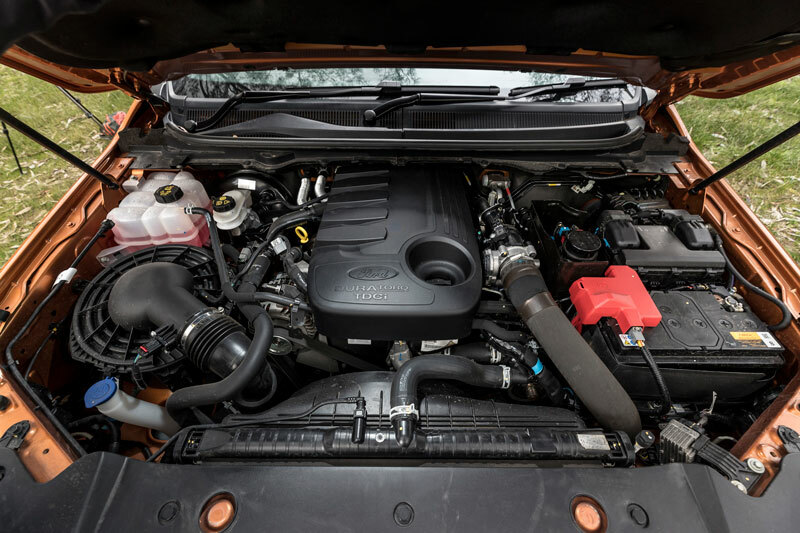 The Ranger’s engine is backed by an agreeable six-speed ZF gearbox that generally does all you want and nothing you don’t want. The engine’s solid low-rpm torque and not overly tall final drive gearing also means it holds sixth at touring speeds without question on undulating roads, and even in the hilly stuff it hangs onto the taller gears well. 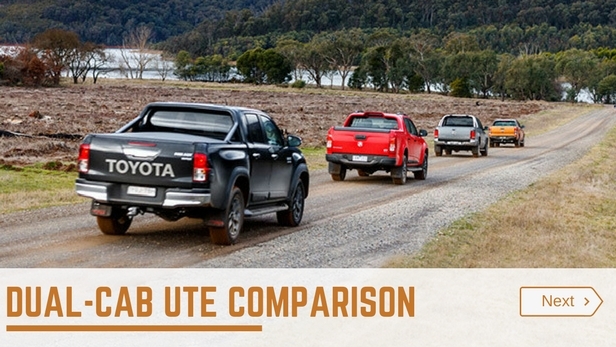 If there’s one thing not to like about the Ranger’s powertrain it’s the fact that it consistently uses around 10 per cent more fuel than most competitor utes, although that may be more due to the fact that the Ranger, along with the BT-50, is bigger and heavier than most of the opposition. The Wildtrak’s electric power steering (EPS) makes light work of manoeuvring what is the longest and nearly the heaviest vehicle here and is especially welcome in tight parking situations. Once underway however, the Ranger’s steering firms up nicely to provide plenty of feel and feedback at open-road speeds. Nicely sorted suspension too, which helps give the Wildtrak an agreeable ride – even unladen – and reassuring stability on bumpy roads, something no doubt helped by the extra-long wheelbase. Where the Wildtrak is over 3.2 metres, all the others are under 3.1 metres. The Wildtrak’s extra-light low-speed steering also helps in tight off-road situations and makes lock-to-lock wheel twirling a breeze. Still the Wildtrak is a long ute in this company, so tight switchback trails aren’t it’s forte. Better vision from the driver’s seat would also be a bonus, especially for shorter drivers. Otherwise the Wildtrak gets the job done off road with little or no fuss. First up, the chassis provides substantial wheel travel at both ends and there’s decent clearance too, although the factory-fit towball does reduce the departure angle more than you’d like. Like all Ranger dual cabs the Wildtrak also comes with a rear locker that, when it’s engaged by the driver, keeps the traction control active on the front axle, an advantage it holds over the TRD. The Wildtrak also claims the deepest fording depth, its 800mm being 100mm more than the Hilux, 200mm more than the Colorado and a significant 300mm more than the Amarok. As you expect the Wildtrak’s cabin speaks luxury with its leather trimmed and heated seats. And it also doesn’t want for much kit (See What You Get), although there’s no reach adjustment for the steering wheel, keyless entry or push-button start. Still that doesn’t stop the driver getting comfortable and the extra-long cabin means that a tall passenger can sit behind a tall driver in the Wildtrak and have more legroom than with any of the other utes here. Good shoulder room too for three passengers across the back seat, although the Amarok is still a tad better in this regard. Five-star safety too. 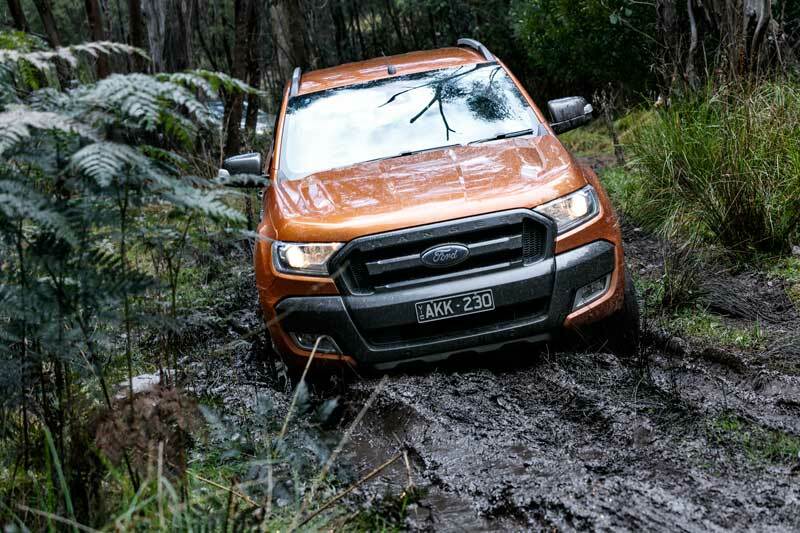 If you want your flash ute to do a little hard work, then the Wildtrak certainly won’t shirk the task. Not only does it have a class-leading tow and payload rating, it also delivers on the promise, as we found out in a recent max load and tow test. 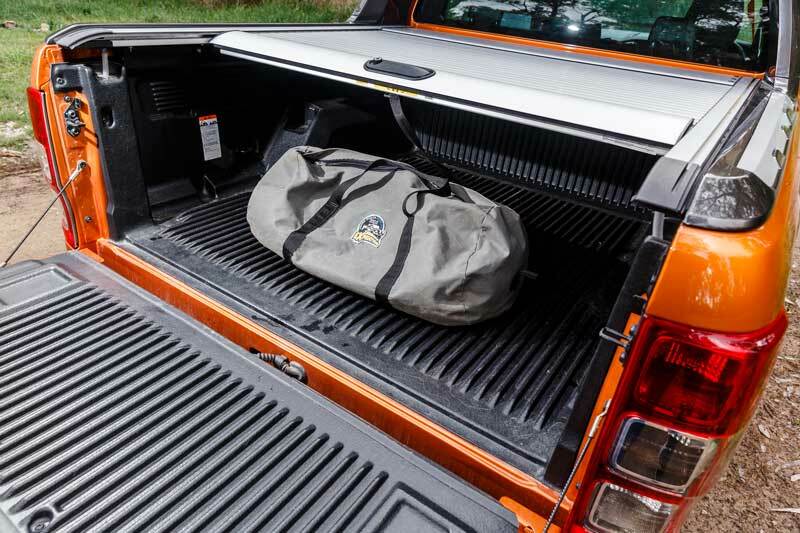 The Ranger also has the advantage of a roller-style metal tonneau, which offers lock-up stowage, something the others here can’t match. The Wildtrak also comes with a towbar as standard and will also take 17s off the lower spec models for wider off-road rubber choice. The Wildtrak is the premium Ranger model and adds to the volume-selling XLT a reversing camera, front parking sensors, leather, heated front seats, power-adjust for the driver’s seat, 18-inch alloys, a tub-mounted body kit and a lockable roller tonneau. Our test vehicle was also fitted with the optional Tech Pack, which includes radar cruise control, forward-collision warning, lane-departure warning and a driver-impairment monitor, and adds $600 to Wildtrak and $1100 to XLT (includes rear-view camera). Like the XLT, the Wildtrak also has sat-nav, dual-zone climate, a centre-console cooler, rear parking sensors, auto wipers, tyre-pressure sensors, a 230V outlet in the cabin, a 12V outlet in the tub, a sports bar, sidesteps and a 3500kg-rated towbar. This adds to the six cabin airbags, cruise control, auto headlights, rear locker and trailer-sway control, standard on all Ranger 4x4 dual-cab pick-ups. **Based on test fuel use, claimed fuel capacity and a 50km "safety" margin.